After college, I was thinking about moving up from 5Ks and 10Ks by jumping into a marathon. I called my old coach and talked it over with him, as he had decades of experience training athletes for marathons and competing in marathons himself. I still remember his simple, yet profound, advice: respect the distance. If you’re embarking on marathon training, I implore you to listen to those words now. You see, marathons are tough. This is a monumental achievement. So big that tens of thousands of people worldwide consider running a marathon a lifetime achievement. Read that again. Lifetime achievement. Not a new year’s resolution, or a good fitness goal, but something they’d like to accomplish before they kick the bucket. The training required to successfully (meaning injury-free and running all the way to the finish line) complete a marathon can be intense. For a novice runner with a zero-fitness baseline, it requires learning how to run, creating a training plan, knowing the techniques to stave off injury, and keeping a dedicated discipline for many long months. Notice, I haven’t even mentioned the actual running required on a weekly basis! Start NOW. Identify every possible source of discipline and accountability that you have at your disposal: cell phone alerts, calendar placement for each run, telling your friends and coworkers, reminders on your bathroom mirror, refrigerator, coffee maker, car dashboard, etc. (Getting the hint? Put it everywhere!) You should literally “trip over” your goal and be constantly reminded that you’re creating a new habit - running. Create or purchase a training plan. Depending on your current fitness level and running ability, completing a full marathon can range from doable to very difficult to potentially dangerous. Plan your training accordingly. If you need to, consult appropriate doctors and/or hire a coach to guide you through the process. Also, start with a run/walk method if you’re not in great shape to get used to the added aerobic stress on your body. This will help with your leg muscle development and recovery, without stressing your body too much too soon. Take care of your body. Just like you shouldn’t crank your car and immediately go from 0 to 60 mph, use a dynamic stretching routine to gradually warm up your muscles before each run. Also stretch after you run to keep your muscles humming along as you add mileage and time to your workout schedule. If you become sore, massage and ice the afflicted area(s). Buy proper gear. Appropriate running shoes are probably the most important piece of gear a runner can have. As your shoes become an extension of your foot, purchase ones that are designed specifically for your feet and running needs. I recommend going to a specialty running store and being professionally fitted. Sure, it might be more expensive than buying a pair of cheap “tennis shoes” on Amazon, but trust me - it’ll be worth it. Also, get a few pieces of clothing that don’t chafe when you’re out on the roads. While you might not notice it on your 5 mile runs, nothing hurts more than chafing in sensitive areas 20 miles into a race with a 10K to go. *Pro tip: body glide, body glide, body glide. Train to the race. If the race is 26.2 miles of hilly terrain, you’re going to want to experience some hills in your training. Similarly, try and get familiar with the type of weather your race will have. This is tougher for those destination races (looking at you, New Yorker running the Disney Marathon in Florida), but try and plan some of your runs in a climate similar to the race itself. In doing so, you’ll be more physically prepared and have more confidence. Decide on a goal and stick to it. Think about how fast you’d like to complete the race. Once you’re used to running regularly, challenge yourself to run at a faster pace that aligns with your goal in order to get accustomed to what race day will feel like. It may be helpful to find a training group, especially one that has runners trying to maintain a similar pace, to keep yourself accountable. I can’t stress this enough: if a marathon is on your calendar, the most important thing for you to do is start running. Get out there and log some miles. Be smart, recover well, hydrate properly, and run. 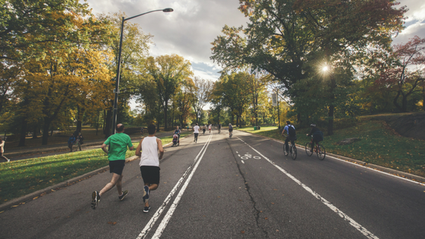 If you’d like some personalized advice designed for your body and lifestyle, or you’d like to learn more about mentally preparing for your first marathon, don’t hesitate to reach out. John Keenan is a running and mental skills coach located in Atlanta, GA. To work with John on your marathon training plan and learn how to build mental toughness in training and racing, click here.